I work with many weekend warriors, strength training enthusiasts and overhead athletes in my practice. One of the more common dysfunctions I see in this population is either asymmetrical or general thoracic spine hypomobility (decreased range of motion). This can predispose you to shoulder, back and hip dysfunction, as well as increase the risk for overuse injuries. In addition, it may also alter the natural biomechanics of movement, thereby negatively impacting performance. With all the sitting and screen time we engage in, it is no surprise we are developing a generation of people with forward heads, rounded shoulders and kyphotic posture. 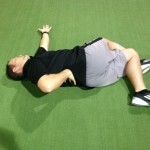 This leads to reduced thoracic spine extension. 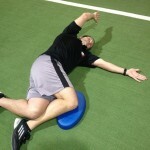 Additionally, I often encounter decreased thoracic spine rotation. If this becomes restricted, asymmetrical overhead athletes may face increased stress on the lumbar spine, hips and glenohumeral joint. Common dysfunctions I treat related to this is rotator cuff tendinopathy, labral pathology, mechanical back pain, and hip pain to name a few. 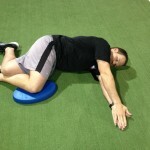 To combat stiffness and promote more optimal mobility, I encourage my clients to perform daily mobility work. I have included a video I filmed for PFP Magazine in my column ‘Functionally Fit’ below that illustrates an effective way to combat reduced T-spine extension. 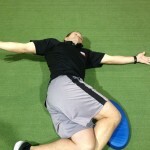 Be sure to check back for my next blog post on how to increase thoracic spine rotation.